Heading over to the UK on your OE? If you’re driving around you’ll see a few new animal signs that won’t be familiar from driving on New Zealand roads. There are two types of squirrel in the UK: the uncommon native red squirrel, which you’ll mostly find in Scotland, and the imported American grey squirrel which out-competes the red squirrel for food. 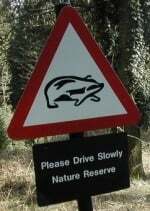 You’ll find grey squirrels everywhere but will only see this sign if there are high populations of red squirrels. Badgers are mostly nocturnal with a grey coat and prominent black and white striped head. They don’t move that quick, and because they’re active at night, you’ll blind them with your headlights. Be prepared to slow down and stop. Large deer are shy but will sometimes be seen in forested areas. The larger bucks can cause considerable damage to your vehicle if you hit them. Ducks (and most waterbirds) have very little road sense, and you’ll be familiar with that if you’ve driven around New Zealand. Sheep will mostly be fenced except you might find in some areas of the Scottish Highlands, Wales and the moors that sheep are roaming on the road. As with sheep, sometimes cattle are unfenced. Unfenced livestock are controlled with cattle grids and these can be especially slippery in cold, wet weather. Be very careful if you are on a motorbike. Otters used to be prevalent around the whole coastline. They’re making a comeback and you’ll find this sign in some areas where they are known to cross roads. Some areas still have horse-drawn vehicles as tourist attractions. This sign is likely to be seen in rural areas where you will see riders on horses. Don’t speed past riders on horses because they can spook the horse which might throw the rider into the path of your vehicle. Wild ponies are uncommon except for semi-feral herds in Dartmoor, Exmoor and the New Forest which are privately owned but allowed to roam free.